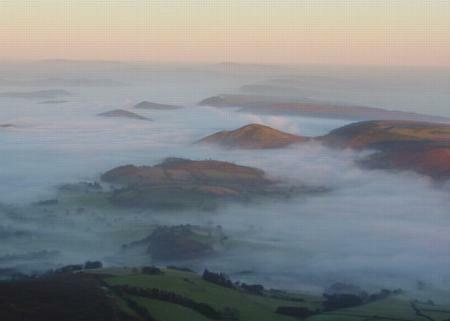 As many of you know, the 17th December 2003 was the 100 year anniversary of powered flight, and on this day at 15:35GMT (the actual time the Wrights did their 120' hop) I was above Wales on a glorious foggy day, as you can see. As chance would have it my airfield was high enough to be out of the fog, which made for one of the most glorious flights I have undertaken. 17th December 2003 15:05 GMT. Looking East from above Gladestry, Powys, S.Wales. (That's Hergest ridge above Kington on the right of the picture; the fourth lump along is about where Shobdon airfield is. On the horizon to the left are the Malverns.) Where we live we were fogged in all day but the airfield I keep my aircraft is higher and the fog cleared at 13:30. We were airborne at 15:00 and down at 15:45 - thus airborne for the 100 years anniversary - to the second. 17th December 2003 15:28 GMT. 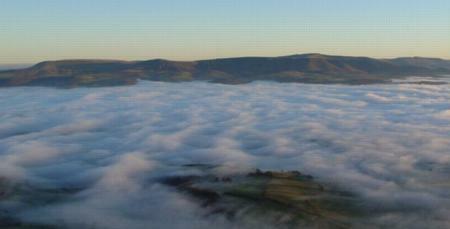 Looking South from above Glasbury towards the Black Mountains. This was one of the most spectacular flights of the year. It looked as though the polar ice-caps had melted and the Wye valley was like some sort of inland sea with the Begwyns and Clyro Hill an Island. 17th December 2003 15:37 GMT. Looking North towards New Radnor. We kept a careful eye out to make sure we wouldn't be fogged in on our return. Curiously, there was nil wind on the ground but up here at 2,500' there was a SouthWesterly at 25knts - matching the Wright's wind velocity, but not the direction.